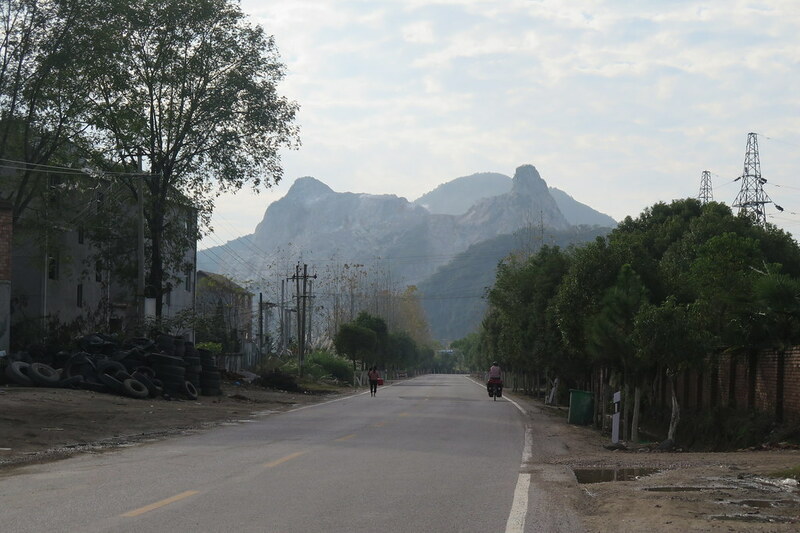 We didn’t have a particularly long day to get down to the next city on our way south, Tunxi, or as it’s been renamed, Huangshan City. Even with the cloudy skies, the riding was good. There was a bit of a climb initially to get out of town, but following that we were coasting a lot of the way going generally downhill. 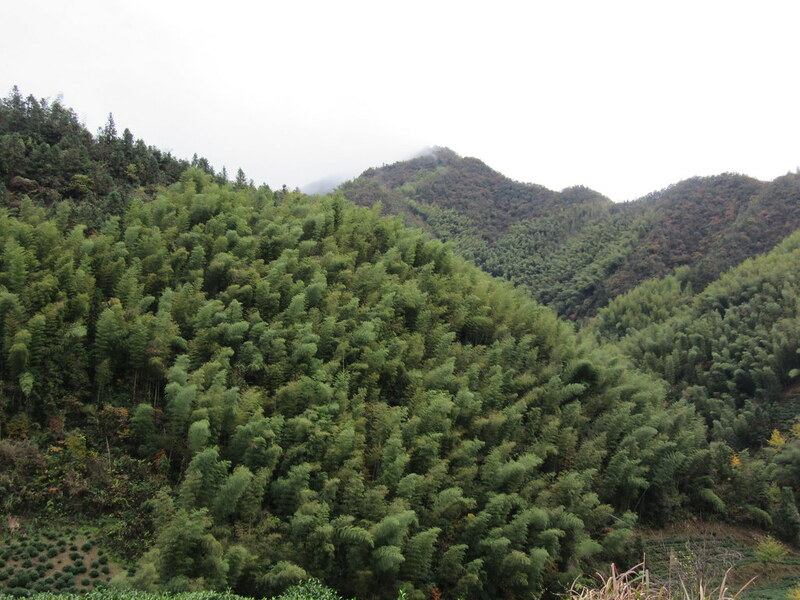 The mountains were covered in bamboo forests and the mist stuck to the hillsides and hung in the valleys. We followed a river for most of the way and enjoyed a really peaceful quiet road. 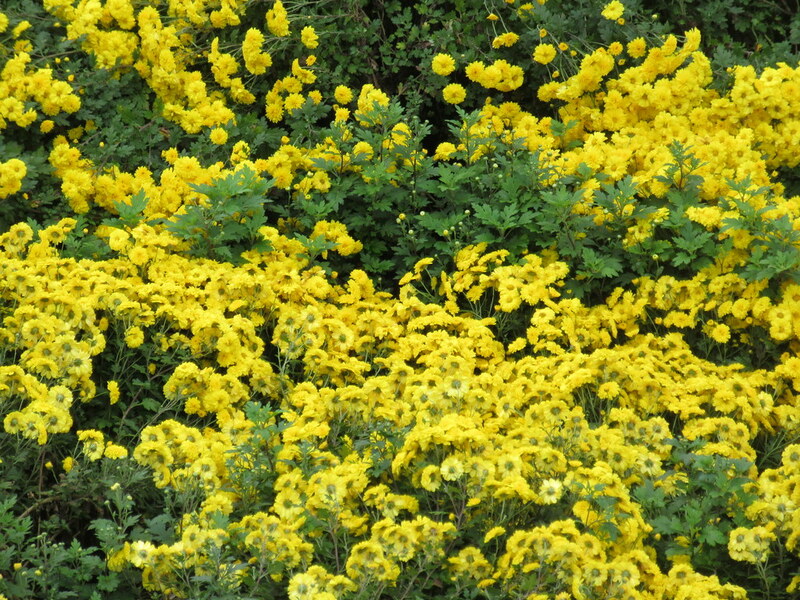 There were small yellow flowers growing everywhere that were being harvested by farmers and gathered into big sacks beside the road. We didn’t really know what they were for, until later in Tunxi we saw the same flowers on expensive packages of tea being sold in all the tourist shops. 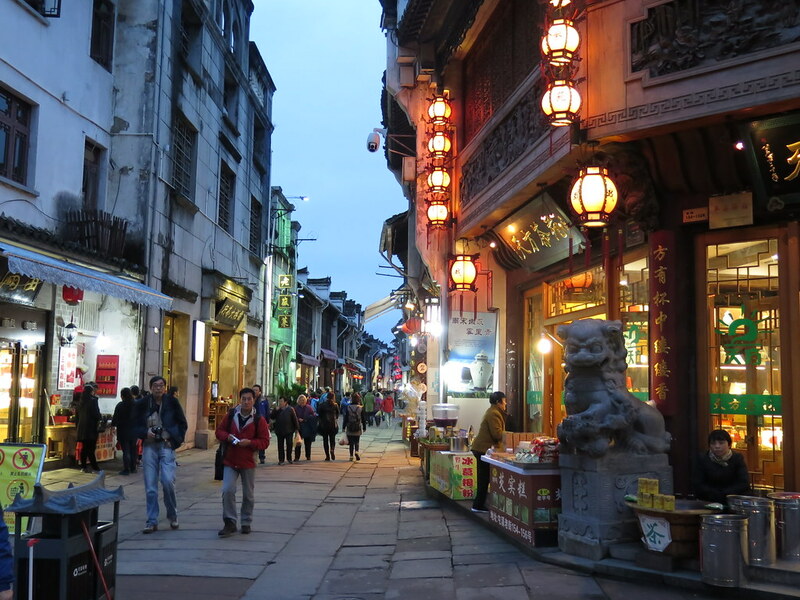 Tunxi is the gateway to the Huangshan area (hence being renamed Huangshan City) and is quite a tourist spot in itself. Once we got into town we went for a wander around the ‘Ancient Road’ area and along the riverside. It had been renovated into a traditional style, but with row after row of shops selling identical touristy stuff. It was actually quite a nice town and something a bit different to the usual bland places we’ve stopped in. At Tunxi we had a good look at the map and realised that we’d need to start putting in some consistent longer days if we wanted to get to Hong Kong in decent time. Initially it seemed quite daunting, but we’ve now really got into a rhythm and we’re enjoying each day for the cycling itself. I think we’re in pretty good shape now and the satisfaction of seeing actual progress on the map is a reward for the time in the saddle. So far we’ve done 7 days back to back of around 100km. 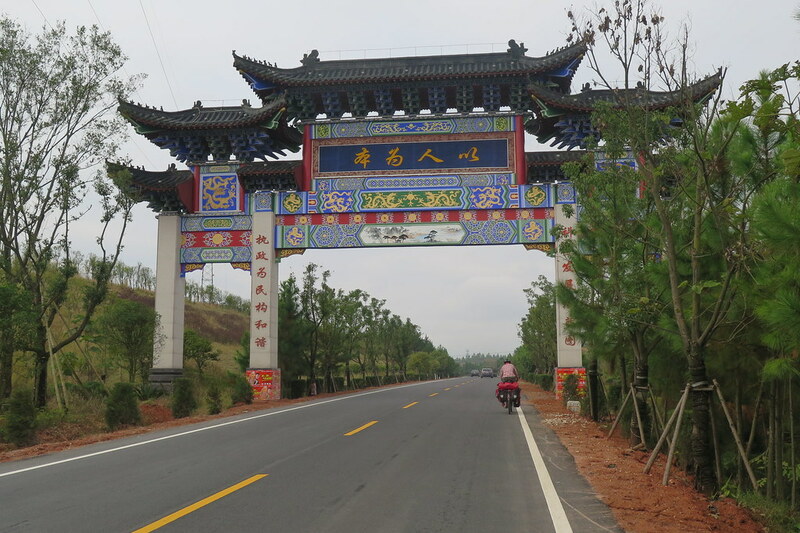 The first day out of Tunxi took us up and over a pass, out of Anhui Province and into Jiangxi. The road went through some really touristy areas. 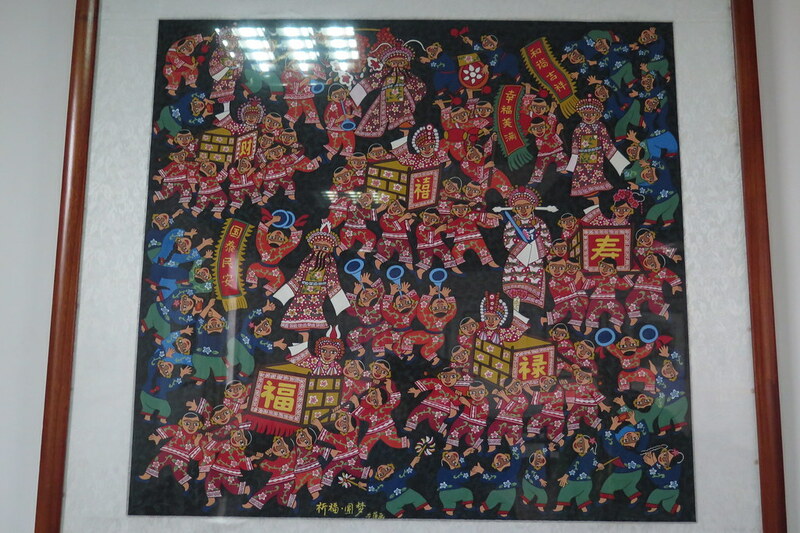 This part of the country is famous for its traditional villages. 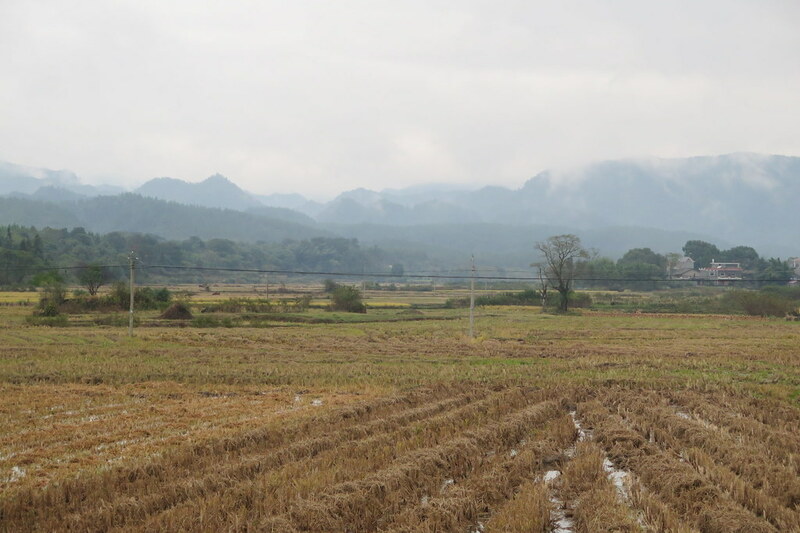 The countryside is really picturesque and the villages are beautiful, usually tucked in a valley or next to a river. 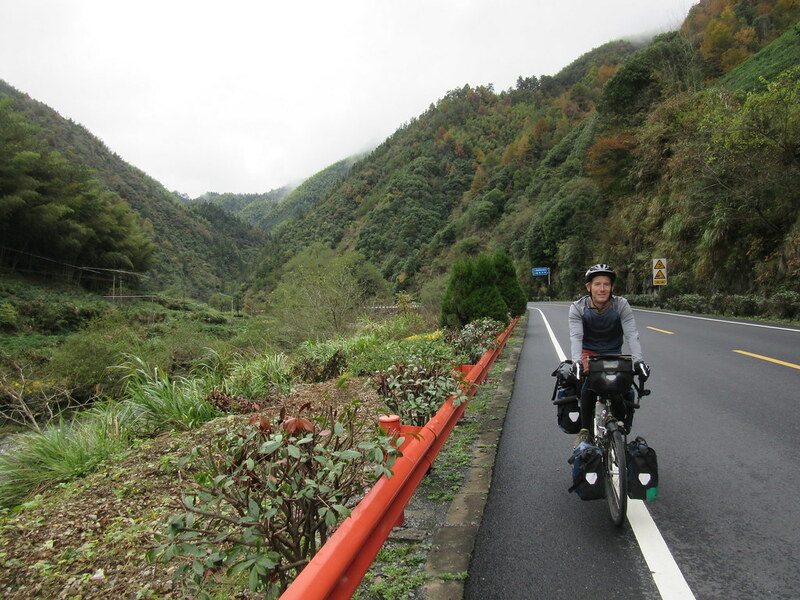 Like many tourist attractions in China, most charge an admission fee, so we didn’t go into any of the more popular ones, but we did ride through numerous other quaint little hamlets. Unfortunately we were accompanied on the roads by all the tour buses and when we stopped for a food or toilet break, we’d become a tourist attraction ourselves. We took one photo all day, when we had a quick tea break in a quiet spot before the pass. The next day was a bit of an adventure. 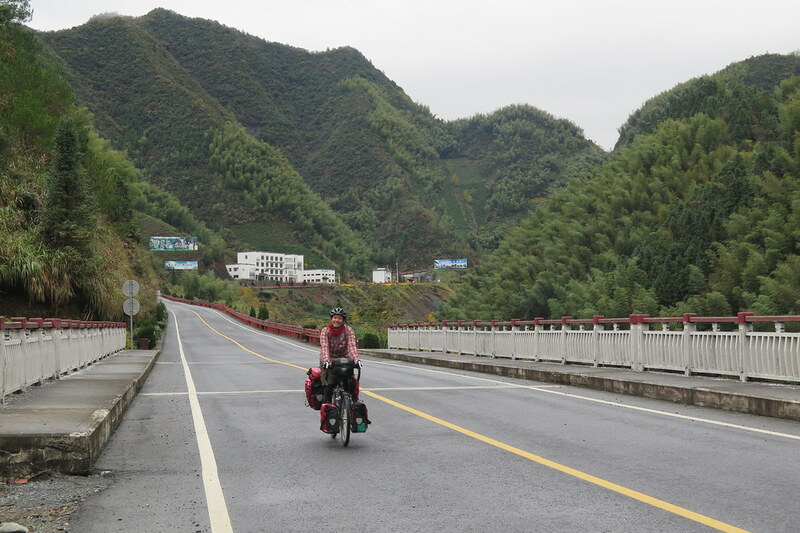 From Wuyuan, where we stopped for the night, we were heading towards Leping. To start the day, leaving the city, I got hit by a scooter in the morning traffic. Only a slow speed thing, he cut right across the front of me so my pannier took most of the impact and he ended up dropping all his stuff onto the road. No damage done. Being a Sunday, we figured there would be more tour buses out on the roads so we looked for a minor road to take us in the direction we wanted to go. 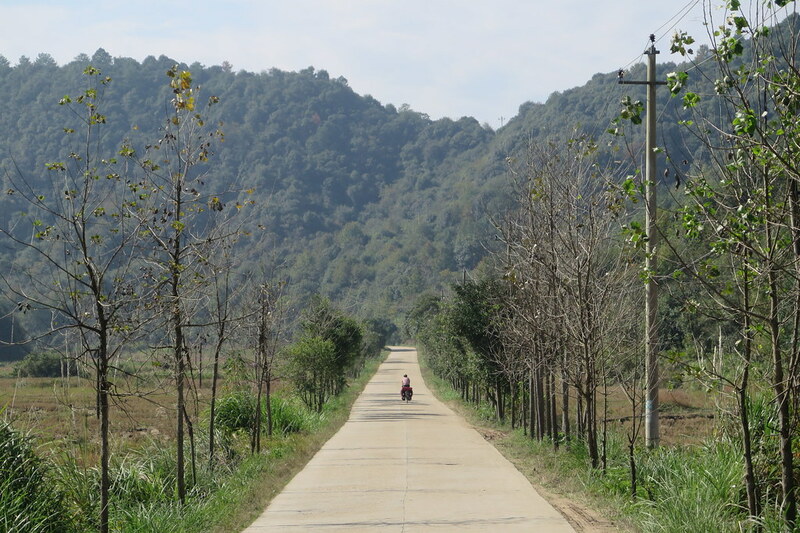 Initially the road was perfect, very quiet and taking us along the opposite side of a river to the main road. 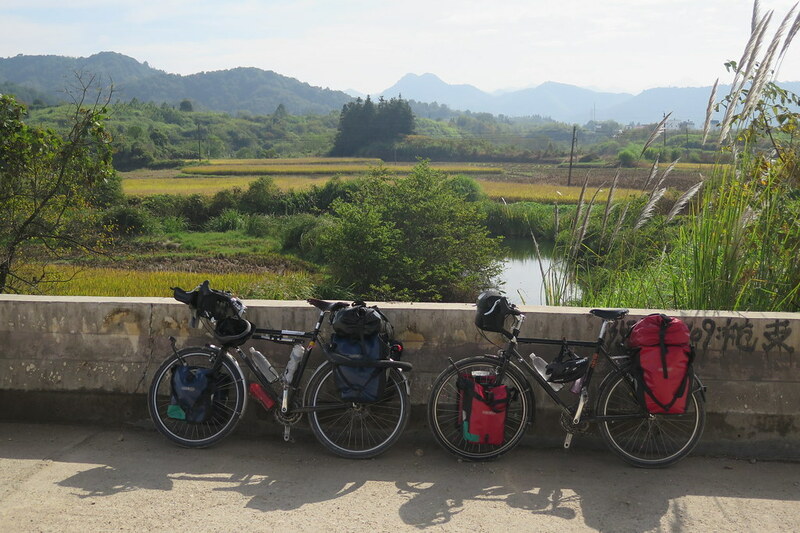 We went through a few really quiet villages riding side by side so we could chat as we cycled. 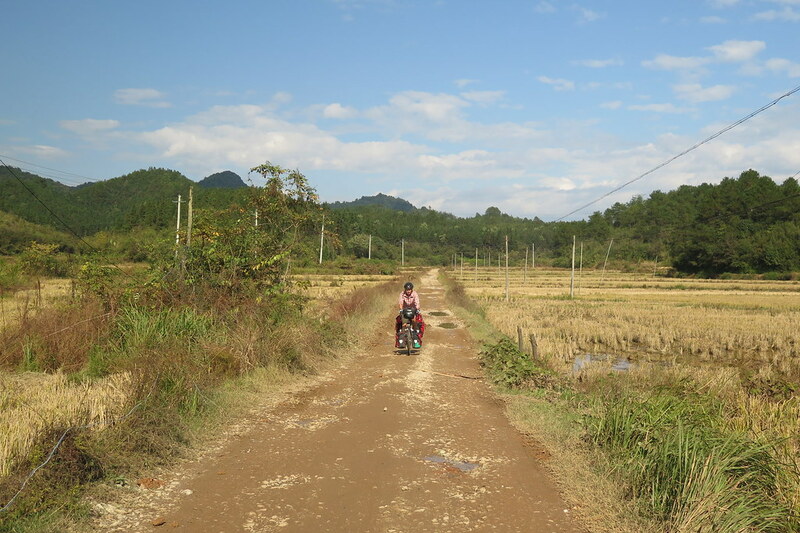 But by late morning, the road was looking very narrow and was covered in rice laid out to dry in the sun. Then it just dead ended in a village, with nowhere else to go. We tried asking for directions, and people just pointed us back in the direction we’d come from. We spotted a dirt track spurring off from the concrete and it looked to correspond with the map, so we took it, hoping it wouldn’t be dirt for long. It continued for around 10km, covered in potholes and mud, at times completely submerged under long stretches of water. We were lucky the day was sunny, otherwise the track would probably have been impassable. Just as we were really getting concerned that it might just come to a dead end in the woods, a few vehicles come through from the opposite direction, and before too much longer, we were back on a concrete road and back on course. That night in Leping, it rained heavily. The following few days, the weather stayed mostly the same. We just got the waterproofs out and got on with the riding to cover the distance. It doesn’t sound too enjoyable, but it was fun to be pushing on through the rain and riding quickly. 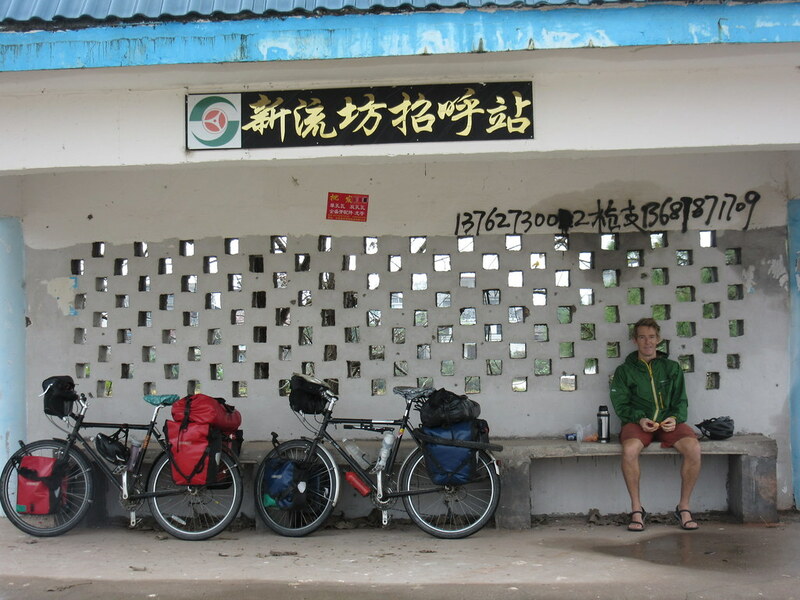 We’d have a break under a shelter somewhere mid morning for a tea and some Oreos (which have become our go-to snack!) and then find a cheap restaurant for lunch. 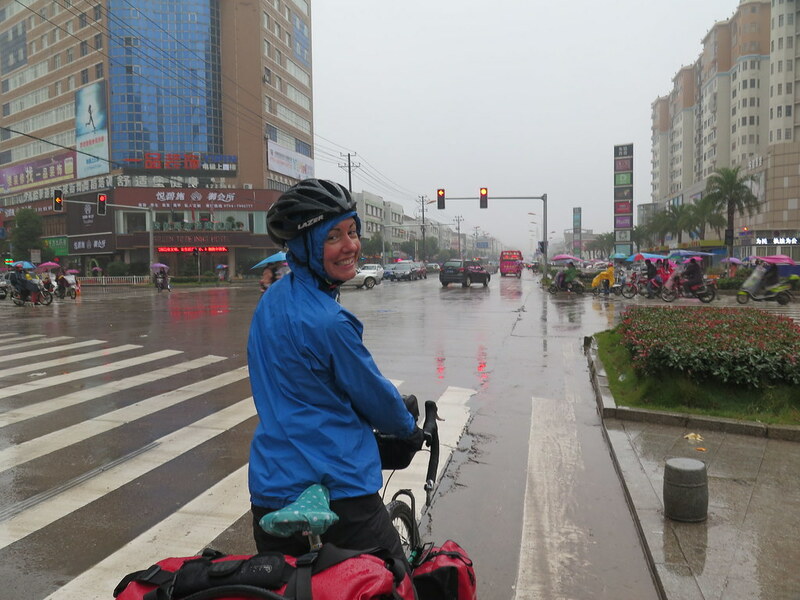 We’ll usually clock up the 100km by 3 o’clock or so and be in a hotel out the rain, feeling satisfied with the day’s ride. We have had a couple of sunny days too, and we’re noticing the further south we get that the temperature is rising again. We’re outrunning the winter! Although we are mostly on the more major ‘S’ and ‘G’ roads, they’re quiet outside the cities. We usually ride through countryside, dodging chickens or cows in the road and occasionally getting chased by dogs. 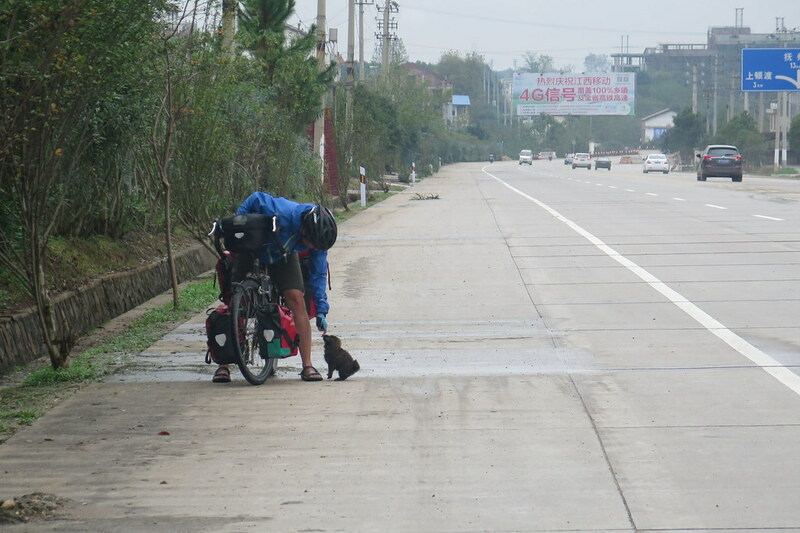 On one busy stretch, we saw a tiny black puppy running out in the road, dangerously close to the trucks. Clare lured him over and tried to get him off the road. He couldn’t have been more than a couple of weeks old and she was very tempted to just pick him up and carry him with us in a pannier. 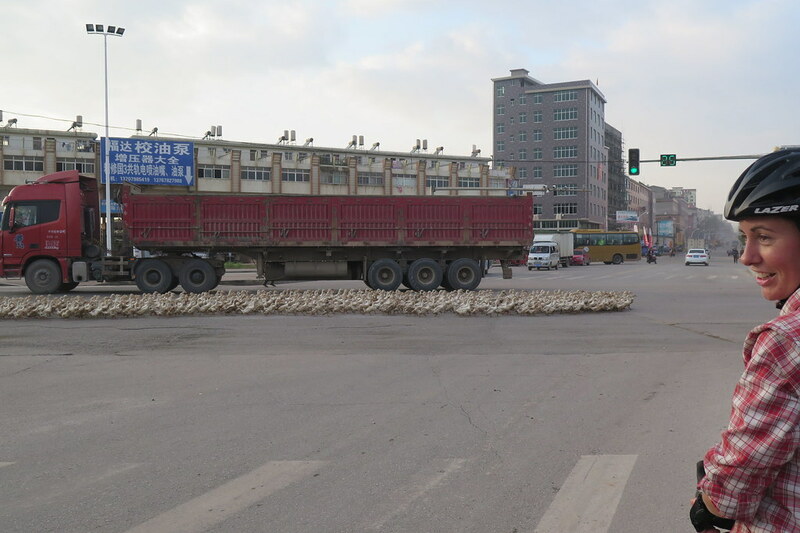 We also saw hundreds of ducks getting herded through the centre of a city across a major junction. The traffic just seemed to continue around them and keep going. Maybe we’re starting to get used to China, as we didn’t really find it too surprising, just laughed and continued! 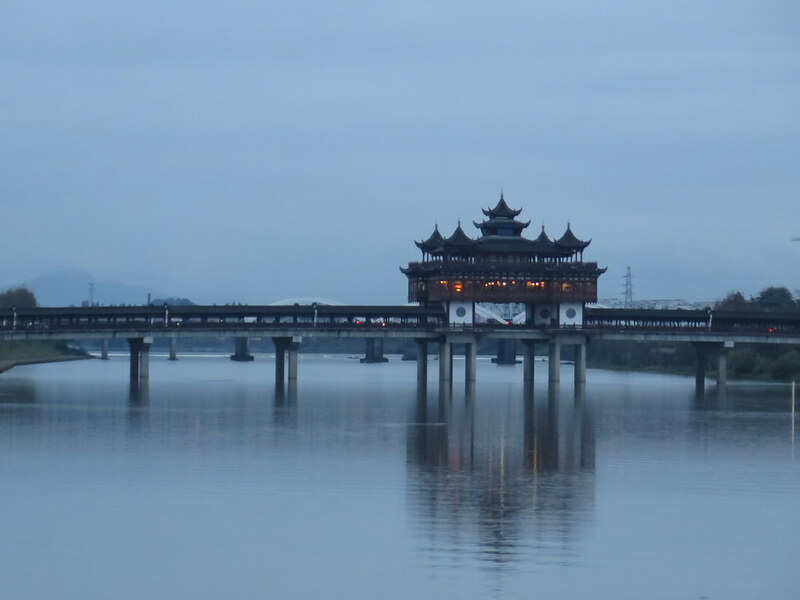 We went through the cities of Fuzhou and then Ji’an joining the G105. 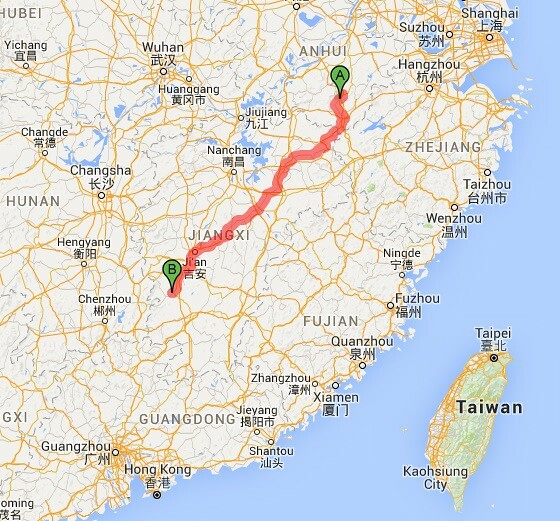 This is a main route, from Beijing down to Zhuhai, next to Macao. We’ll be following this for a couple of days longer before we branch off to head towards Shenzhen and the border crossing to Hong Kong. 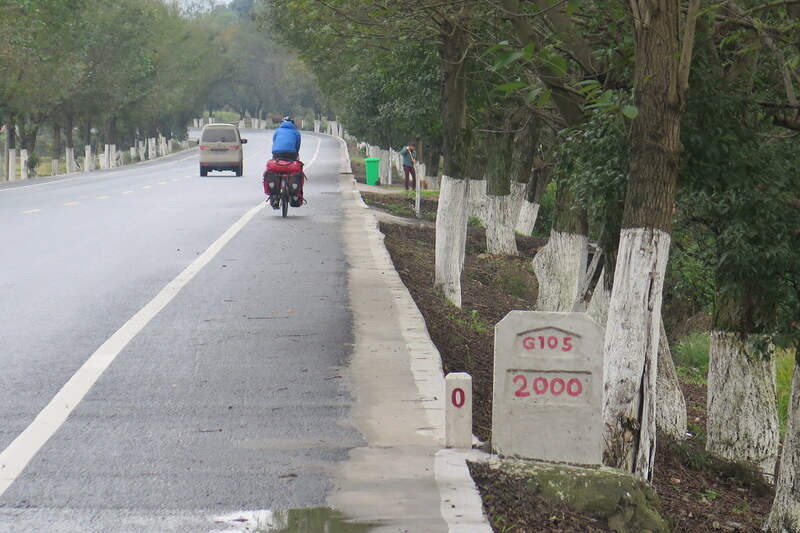 Alongside the road are mile markers (or kilometres, in this case) showing the distance from Beijing. 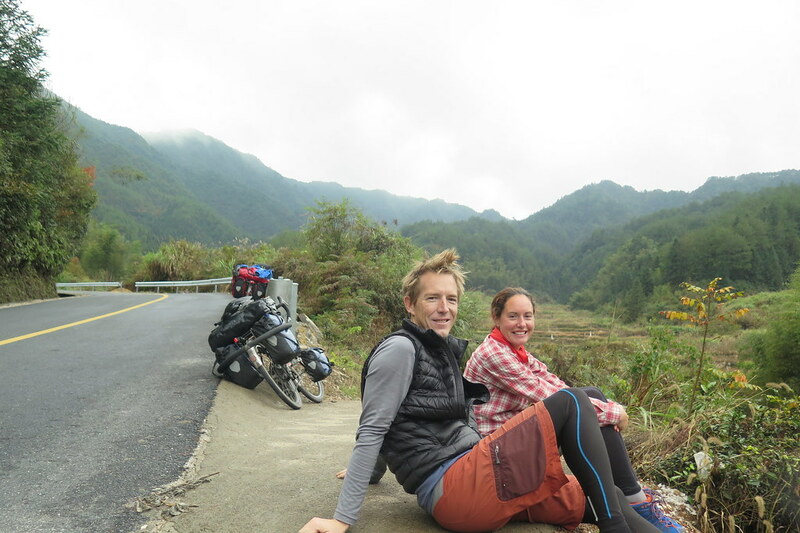 On a quiet part of the road between Ji’an and Suichuan, we stopped for tea in a roadside carpark and rest area. A Chinese guy came over to us and introduced himself, in excellent English, as ‘Charles’. 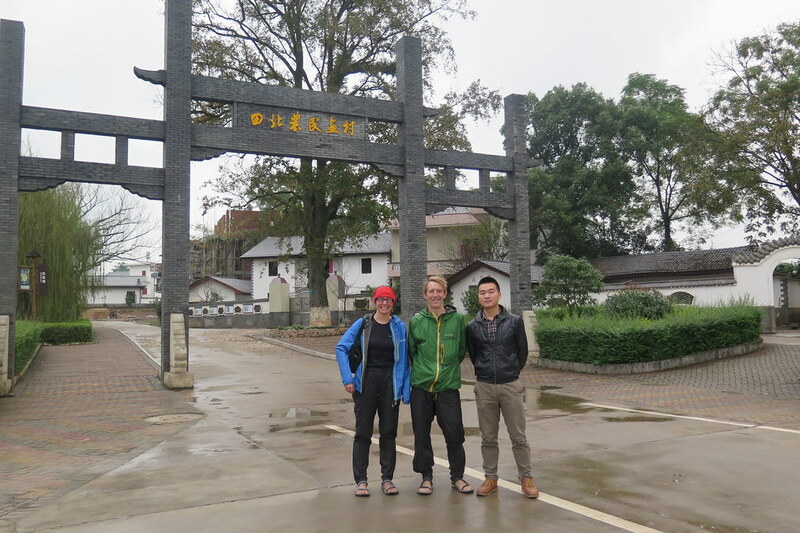 He’d majored in English and worked as a tour guide in the tourist village we were passing. As only the fourth foreigners they’d ever had there, we were photographed and given a free tour of the area. We were keen to keep moving, but actually it was nice to have a longer stop and have a look around the village and art gallery. 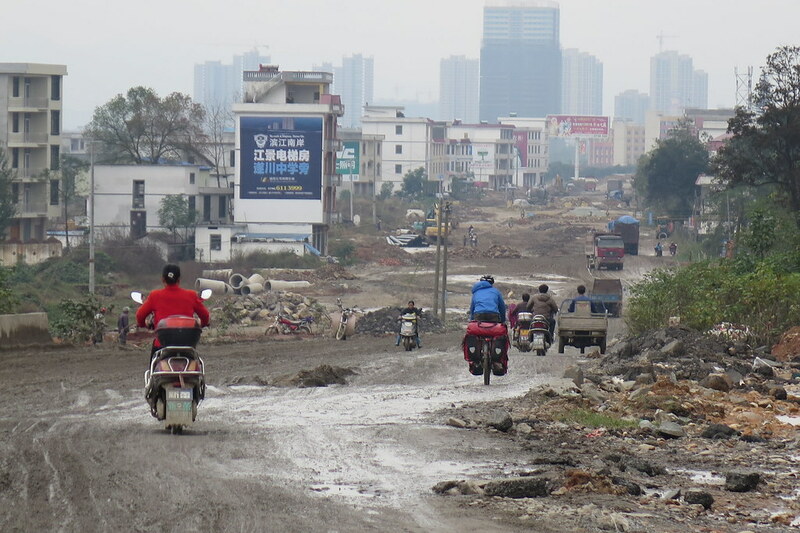 On the final few kilometres into Suichuan, we were confronted with the worst road we’ve seen so far. It was pure mud with all the rain we’ve had, and continued all the way into the city. Big trucks and other vehicles were carving up the road, cutting deeper and deeper tracks into the sludge that we were trying to ride through. It took a while to pick a route through, trying hard not to stop and put a foot down. We made it in the end and got into a hotel to shower off. During Clare’s shower, we had a knock at the door from a policeman who insisted that we fill out a document for visiting foreigners. Usually the a hotel will do this themselves, so maybe the guy just wanted to be extra efficient, or maybe he just wanted to check out the foreign cyclists. 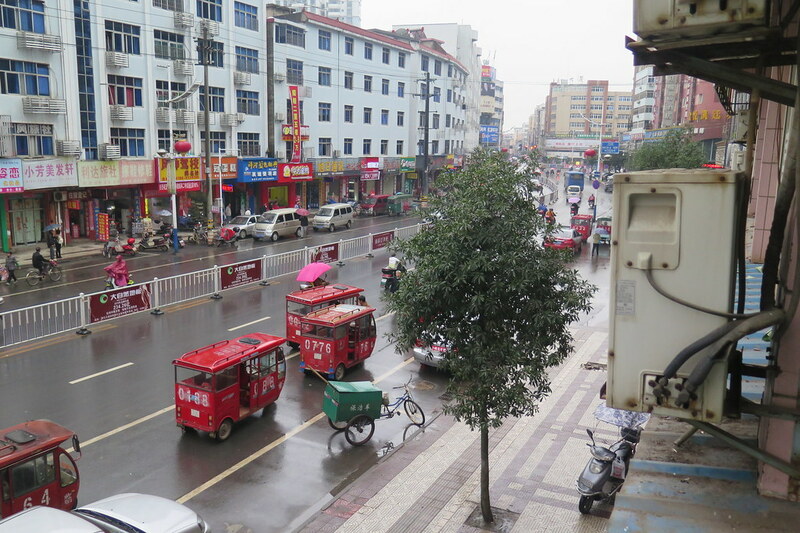 Now we’re in Suichuan, with about 6 days and 580km to go to Shenzhen. Then we’ll have a break for a week or so staying with friends in Hong Kong, hopefully arriving before next weekend. Great blog. Sounds very adventurous especially being hit by a scooter! Keep the peripheral lookout going.